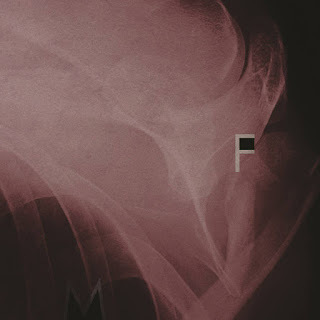 Father Murphy are a band from Italy that plays an occult form of psychedelic pop rock and this is a review of their 2014 ep "Pain Is On Our Side Now" which was released by Aagoo. Heavy and distorted drones and harsh noises start off the ep along with some industrial sounds and after awhile the music gets more avant garde and experimental along with some psychedelic sounds being utilized from the keyboards and percussion's are added into certain sections of the recording and the bring a very militant feeling to the record. The music starts getting more diverse on the other tracks with some spoken word parts being added in along with some distorted guitars and melodic singing as well as some movie samples and some of the tracks are very long and epic in length and they also have a bonus ep that contains the edited versions of the track and they also have a more dark and evil sound than the original versions as well as adding in elements of neo classical and chamber music. Father Murphy have a very original and ritualistic sound with their music taking an occult form of psychedelic music and adding in some pop elements along with a good amount of drones and harsh noises to create their own sound, the production has a very dark and raw sound and the song themes cover Occultism and the Catholic sense of guilt. In my opinion Father Murphy are a very great sounding occult psychedelic pop band and if you are a fan of this musical genre, you should check out this ep. RECOMMENDED TRACKS INCLUDE "Bones All Gone" and "Despite All The Grief". 8/5 out of 10. I’m just getting everything finalised for the re-release of Atlantean Symphony, out 05-05-14, which includes 2 bonus tracks. It comes in as a lavish antique book style pressing on CD – perfect for collectors (like myself). The bonus tracks are CD only, the rest are available as a download from all the usual places. Beyond that, I’m also working on Resonance of the Pyramids for an album release in 2015, and also a sequel to Atlantean Symphony, which will pick up where the concept of the current release ends. I’m also re-working the first Dreamfire demo – Through Shades of Eternity – so there is plenty going on at the moment. 2.How would you describe the musical sound of the newer material and also how does it differ from the stuff you have released in the past? Essentially, the demo material was like a sketch, something on which I built many layers and textures to bring what was the ultimate realisation of the concept to fruition. The advances in music technology helped to complete the vision, to give life to what my imagination began to form all those years ago. It would have been impossible for me to do anything like what became the final album when I began to write the Atlantean Symphony demo back in 2001. 3.Can you tell us a little bit more about the Atlantean concept you have on the new release? The music takes you through the journey from creation to the end of a cycle of existence, ending with the release of the accumulated knowledge, left to drift away upon the metaphorical tide. Ultimately, there is no real end, all knowledge remains, in some form, waiting for those that can hear the call. 4.Your music over the years has explored ancient mysteries, magick, legends and majestic themes, can you tell us a little bit more about your interest in these topics? I have a huge interest in ancient myths, legends and the esoteric, from all parts of the world. And it’s surprising to find so many common themes from what should be, in ancient times, entirely isolated cultures. There is so much to draw on that inspires the writing of music that I have an almost limitless supply of inspiration for starting points, then, once you get inside the concept, become attuned to it, you realise that there really is no limit to where things can take you. 5.What is the meaning and inspiration behind the name 'Dreamfire'? 6.With this project you work all solo, do you feel this gives you more room to be creative with your albums? Exactly. This is a personal and expansive journey – it simply would not work if I had to reach a communal agreement with other musicians who perhaps would not understand the feelings behind the concepts that are to be explored. 7.This project has been around since 1999, what is it that motivates you to keep going after all these years? To put it simply, it is something I have to do. Something that has to come out. Though as I write on my own terms, I never seek to have anything that even resembles a fixed schedule. The art comes at its own pace. Seeking to force it can’t work, it would dilute the essence of what it should be. 8. Imperative PR has been promoting the new album, how did you get in contact with them and also how would you describe the support they have given you so far? Dreamfire is unique, and I definitely didn’t want to be just one of 100 acts being represented by various agencies. Imperative have a combined experience of over 2 decades working in major print media, as well as many other parts of the music industry, so it really was a simple choice to throw all that experience and professionalism behind the release. 9.On a worldwide level how has the feedback been to your albums by fans of symphonic and ambient music? Very good. The music seems to have found a natural home with people who enjoy everything from black metal to ambient music. And a number of excellent reviews from some major publications are always a good thing to receive too. 10.Where do you see the project heading into musically during the future? Each release will be different, as I explore different themes with each recording. Different themes require different sounds, different dynamics. They will, of course, always be under the general heading of ambient/neoclassical – even though I really dislike using a generic term to describe music that is so expansive and immersive. However, buried beneath the surface of all my releases, there will be the Dreamfire constant, the one thing that binds everything together. Nothing is ever truly isolated when dealing with such important themes. My tastes are wide, everything from Bathory to Beethoven, Wagner to Venom, Vangelis to Iron Maiden and so on. I suspect some of my metal side has influenced the bigger parts of what Dreamfire does, and helps to give it an extra dimension. As for what I’m listening to right now, the advance of the upcoming Agalloch album is just incredible! Music, naturally, takes up most of my time - from writing to recording to going to shows etc…etc…but I always manage to make time to sample many fine European lagers with friends whenever possible. I aim to sample beers from every country on Earth! Thanks for the interview. Check out the website for all the latest news and merchandise from the Dreamfire realm at www.dreamfiremusic.co.uk – and of course, there are many music samples and videos to explore for those new to the works of Dreamfire. 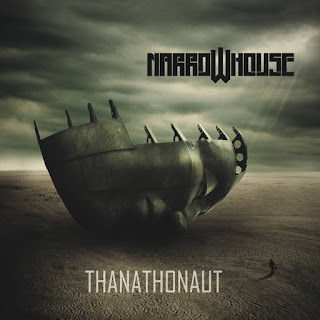 Narrow House are a band from Ukraine that plays an atmospheric form of funeral doom metal and this is a review of their 2014 album "Thanathonaut" which was released by Solitude Productions. Ambient style synths start off the album and they bring an atmospheric sound to the recording and a minute later guitars start to kick in along with violins and a small amount of spoken word samples which are also used on the later tracks as well and on the following track melodic vocals become a part of the music with some of the later tracks having a more stoner vibe due to this style of singing and the album really starts going for more of an atmospheric doom metal sound along with some avant garde elements. As the album progresses death metal growls start becoming more a part of the music along with a small amount of cellos and saxophones which sound like a perfect mix for the funeral doom sound this band creates which also leads to some psychedelic style sounds, halfway through the album acoustic guitars are introduced in certain sections of the recording and they enhance the tragic and melancholic moments of the music and towards the end the music gets more ritualistic and heavy and they also bring in a small amount of female vocals, on the last track black metal screams are added in for a few seconds. Narrow House create a very original sound with their music with a great amount of atmospheric funeral doom metal elements but with much shorter songs than most of the bands of the genre and they band also brings in influences from all styles of doom metal and stoner rock as well as being very experimental, the production sounds very professional and the lyrics cover solitude, self destruction, death and apocalypse themes. In my opinion Narrow House are a very great sounding atmospheric funeral doom metal band and if you are a fan of this musical genre, you should check out this recording. RECOMMENDED TRACKS INCLUDE "Crossroads" "The Mid Life To Sorrow" "Crushing The Old Empire" and "Doom Over Valiria". 8 out of 10. 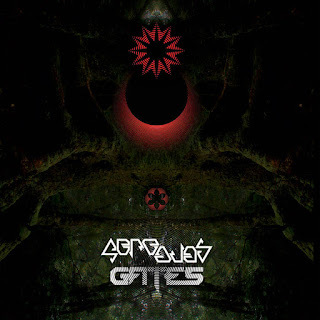 Abre Ojos is a solo artist from Australia that plays a very occult and ritualistic form of dark experimental muisc and this is a review of his 2014 album "Gates" which will be released by Secrets of Giza. Harsh electronic music sounds start off the album along with some atmospheric elements which also leads up to heavy distortion and drones an d the songs have a ritualistic feeling to them along with some ambient elements being added onto the later tracks and each song has a very different sound to them and the songs would be perfect to listen to while meditating for and astral journey and on some of the later tracks there is a small amount of ritualistic chanting being utilized in the background along with some tribal elements. Abre Ojos shows a great amount of diversity with his music taking avant garde soundscapes and adding in a feeling of travelling through the astral body on all 11 of the tracks with the music being mostly instrumental and the production also has a very dark and powerful sound to it along with some of the tracks being long and epic in length. In my opinion Abre Ojos is a very great sounding experimental solo artist and if you are a fan of this musical genre, you should check out this album. RECOMMENDED TRACKS INCLUDE "Falling Suns, Dark Stars" "Revealed In Strange Glows" "The Priests Dethroned" and "The Knowing Of Truth". 8 out of 10. Abyssvsaenvs are a 1 man band from Brazil that plays a very dark and ritualistic form of experimental music and this is a review of his 2014 ep "Abyssum Abyssus Invocation" which was released by The True Blackevil. Ambient style loops start off the recording and start going into a more experimental direction along with some harsh noises along wit h a dark organic sound and the track s tarts getting more diverse during its 13 minutes along with a mixture of both calm and harsh parts being added into the music. Abyssvsaenvs bring in a very primitive and ritualistic sound with the epic track that they bring onto the ep, with the music being all instrumental and occult sounding and the production has a very dark sound that enhances the evil atmosphere of the track. In my opinion Abyssvsaenvs are a very great sounding dark, ritualistic experimental project and if you are a fan of this musical genre, you should check out this ep. 8 out of 10. 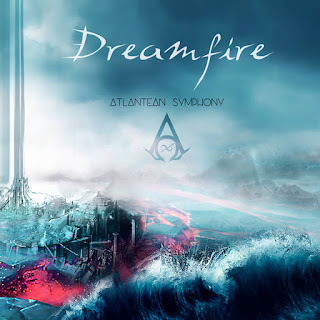 Dreamfire are a project from the United Kingdom that plays a mixture of ambient, neo-classical, atmospheric and new age and this is a review of their self released album "Atlantean Symphony which will be released on May 5, 2014. A very dark and atmospheric sound starts off the album along with elements of neo-classical and water sounds, the music on this album has a very epic and new age feeling style of sound and after awhile classical guitars make their way into the music and bring a dark age medieval pagan feeling to the album. When we get more into the album you can hear small amounts of rain and thunder sound s being utilized at times and you can also hear some traces of fantasy film soundtracks being used in certain sections of the recording along with some ritualistic sounding bells and later in the album there is a 3 part saga about Atlantis which also leads to more orchestra and symphonic sounds finding their way onto the recording and in some of the darker sections you can hear traces of dungeon synth. Dreamfire have a very interesting yet minimal sound with this album with all of the tracks being very atmospheric and combing new age, neo classical and ambient to create their own sound with these instrumental tracks, the production sounds very professional and the song themes cover Atlantic, Esoteric and the Arcane topics. In my opinion Dreamfire are a very great sounding mixture of neo- classical, atmospheric, dark ambient and new age and if you are a fan of those musical genres, you should check out this project. RECOMMENDED TRACKS INCLUDE "Across the Ageless Ocean" "A Reflection of Rebirth Through The Eyes Of The Forlorn" "Into The Temple Of Elements" and "The Opening Of Eternity". 8 out of 10. 502 are a project from Brazil that plays a very dark and experimental form of ambient drone and this is a review of their 2014 ep "Screams In the Endless Void" which was released by the True Blackevil. Experimental soundscapes start off the ep along with some noises and human tortured voices and after awhile the music gets more evil and has a sound close to black metal with the vocals using some grim high pitched screams along with some melodic chanting being utilized in some parts of the recording. The ep is divided into 2 different parts with the second chapter having more reverb and harsh noises sounds while also keeping the grim black metal vocals and after awhile the music gets more tribal sounding and the second track is over 16 minutes which is also 2 minutes longer than the first track. 502 have a very interesting sound to them with their music combing drone, experimental and ritualistic noise with black metal vocals to create their own sound along with a very dark and raw production and lyrics that cover darkness and occultism themes. In my opinion 502 are a very great sounding blackened ritual noise project and if you are a fan of this musical genre, you should check out t his ep. 8 out of 10. 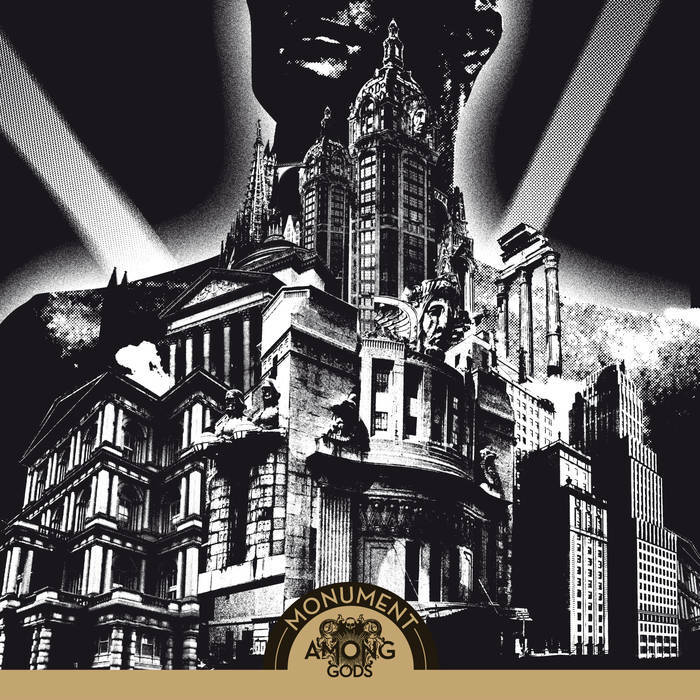 Among Gods are a band from Norway that has been featured before in this zine that plays a mixture of death and doom metal with some black metal influences and this is a review of their 2014 album "Monument" which will be released by PRC Music. Drums a melodic yet melodic sound and death metal growls start off the album along with a heavy dose of doom and when solos are utilized the recording has a more modern feeling to it while the music for the most part is heavily rooted in the early 90's along with some powerful sounding bass lines and the screams add in traces of black metal. In certain sections of the recording you can hear a small amount of out of key clean singing being utilized for a few seconds and in later tracks the music speeds up a bit and brings in a small amount of blast beats along with some element s of melodic death metal while the main focus is on a more slow doom/death metal sound and at times you can hear thrash metal style guitar being added in some of the riffing and on one of the tracks you can also hear a small amount of acoustic guitars. Among Gods stick to the sound they had on the last recording and create another heavy old school doom/death metal album while also having a good amount of diversity to t hem, the production sounds very powerful and makes the old school elements sound even heavier along with some lyrics that cover some really dark topics. In my opinion this another great sounding recording from Among Gods and if you are a fan of old school doom/death metal, you should check out this album. RECOMMENDED TRACKS INCLUDE "Malstrom" "Summon Them Black" "Eternal" and "Feathers Of Doom". 8 out of 10.